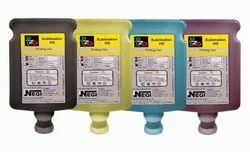 NEGI is an exclusive distributor of PZO Inks like Solvent, Eco-solvent, Sublimation and TextilePrinter Ink for last 19 years and has successfully installed 3000 plus printers all across India.These products are highly preferred by our clients and are available in client-friendly price. NEGI PZO range of Eco Solvent Inks are free from Ink bleeding from media, results in high-speed printing and banding issues are decreased. These Inks are characterized by high colour reproduction and high glossy quality with a mild smell. NEGI is an exclusive distributor of PZO ink for Eco-Solvent Printer for last 19 years and has successfully installed 3000 plus printers all across India. We offer high-quality Inks For textile digital printing which are designed for cellulose, silk & wool digital textile printing. Excellent compatibility with Piezo printing heads. Consistent ink quality & reliable ink stability which allows Excellent Reproducibility. *Based on standard reactive dyes uses in textile. *Easy for ensuring printing reproducible at a high-speed printing mode. *Quick and reliable transfer of digital sampling designs to bulk production. *Excellent for deep black shades printing and Easy to wash off with minimal staining. Reactive Grade for printing on all Natural Fibres. Acid Grade for best printing on Polyamide, Lycra, Wool& Silk. PZO range of Solvent Inks is low corrosive solvents to increase the printer’s sink circuit lifespan and superior adhesion to a wide range of uncoated materials. Our range of solvent inks are characterized by maximum fastness matches the original colour gamut. PZO solvent-based inks are renowned for its easy use, sound reliability, wide colour gamut, and high optical density. Comprised of low corrosive solvents to increase the printer’sink circuit lifespan. Superior adhesion to a wide range of uncoated materials. Vivid colours match the original colour gamut. NEGI PZO range of Sublimation printer Inks are free from Ink bleeding from media, results in high-speed printing and banding issues are decreased. These Inks are characterized by high colour reproduction and high glossy quality with a mild smell. PZO Sublimation Ink is Ideal for transfer printing onto synthetic fabrics (polyester) and onto rigid substrates (pre-treated). Ideal on medium and large format machines, it fully exploits their productive capacities. Speed, reliability and reproducibility of the processes over time meet the criteria of industrial productions. This inks are ideal for Excellent performance printing with last generation plotters onto light and/or low coated papers. Ideal for sportswear and Interior decoration.